Circular Agronomics > Successful 1st European Sustainable Nutrient Initiative. Circular Agronomics was one of six EU H2020 projects that came together to organise the first European Sustainable Nutrient Initiative. Research and innovation are crucial for the promotion of nutrient recycling as an essential component of the circular economy. 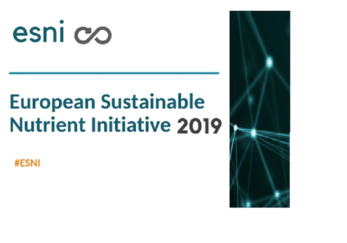 The ESNI (European Sustainable Nutrient Initiative) conference showed how EU research is working to raise awareness on the benefits of nutrient recycling and reuse (NRR). Closing nutrient cycles can help develop a more efficient and sustainable food and feed production system, and protect the environment. Under the umbrella of the Biorefine Cluster Europe, a network of projects working on bio–based recovery issues, six EU projects financed by the H2020 and the INTERREG V B NWE research and innovation programmes joined forces to organise this full-day conference. Around 150 researchers, farmers, policy–makers, industry representatives and other stakeholders came together to discuss and share information on NRR at the first edition of this conference, held on 22 January in Brussels. Prof. Erik Meers, from Ghent University kicked–off the plenary session as Coordinator of the Biorefine Cluster Europe, presenting the current activities and the future steps of this research network. José Ruiz (DG Agriculture), Pavel Misiga (DG Research) and Wim Debeuckelaere (DG Environment) from the European Commission, provided a comprehensive overview of the work that is ongoing at the policy level to promote NRR opportunities in Europe. The representatives of the Commission shared views on the current nutrient-related calls for proposals under the H2020 research and innovation programme and provided updates on the ongoing Horizon Europe negotiations. It was also a timely opportunity for attendees to learn about other mechanisms for discussion and exchange on nutrient recycling topics, and the role of Operational Groups (OGs) and focus groups developed under EIP– AGRI. The six parallel workshops that followed the plenary session focused on the current policy measures, innovative solutions and technological developments related to nutrient recycling. The workshops were coordinated by the six projects involved in the organisation of ESNI: Circular Agronomics, Nutri2Cycle, NUTRIMAN, Phos4You, ReNu2Farm and SYSTEMIC. This interactive exchange of knowledge was also complemented by a poster session and an open space for other projects involved in nutrient recycling to present their activities and engage with participants. This successful ESNI conference was the first of what will be an annual event to support the expansion of nutrient recovery and reuse in Europe through sharing lessons learnt and highlighting policy opportunities.